Nano@IAState is a single day meeting to bring together ISU, Ames Lab and industrial scientists and researchers working on the synthesis and characterization of nanomaterials and applications of nanoscience. The second annual meeting will be held on Friday August 3rd 2018 in the Scheman Building. The meeting will consist of oral presentations and a poster session. The meeting is open to ISU and Ames Lab graduate and undergraduate students, staff and faculty, and members of local industry. Invited oral presentations will be given by ISU/Ames lab faculty and members of local industry (see the preliminary program below). Contributed oral presentations from ISU graduate students/post-docs will be 15 minutes in duration. The poster session is open to all participants. Registration closes Wednesday August 1st, 2018. There are only a few slots remaining. Register Here. Rizia Bardhan (Vanderbilt University) and Peter Collins (ISU MSE) will give 45 minute plenary lectures. 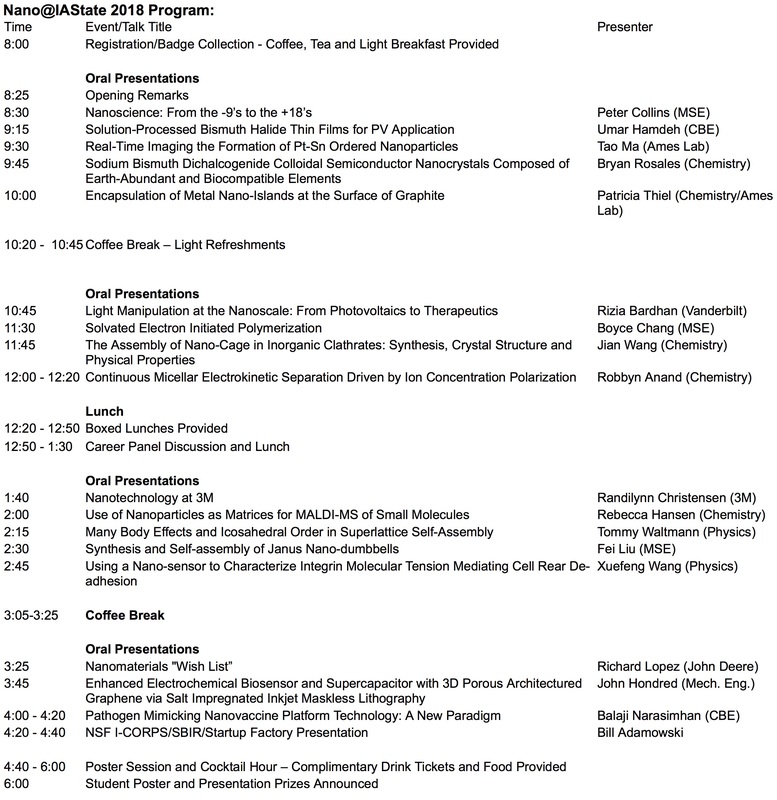 Invited 20 minute presentations will be given by Robbyn Anand (ISU Chemistry), Balaji Narasimhan (CBE/Nanovaccine Institute), Pat Thiel (Chemistry/Ames Lab), Xuefeng Wang (ISU Physics), Randilynn Christensen (3M) and Richard Lopez (John Deere). A complete program with abstracts can be downloaded here. Iowa State University Research Park, The Department of Materials Science and Engineering, The Ames Laboratory, ISU VP Research, The College of Engineering, The College of Liberal Arts and Sciences, The Department of Chemistry, The Department of Chemical and Biological Engineering and The Department of Physics and Astronomy. Contributed Oral Presentations will have a total duration of 15 minutes, including a few minutes for questions from the audience. Please prepare your talk so that it lasts 12 – 13 minutes. The boards for Poster Presentations will be 4′ x 4′. Please make sure your poster is 4′ wide or narrower. Poster boards will be available in the second floor Scheman lobby at the start of the meeting. Please hang your poster in the morning when you arrive. The poster session will take place from 4:40 to 6:00 pm. Cash prizes will be awarded for the best student poster and oral presentations. The meeting will take place in the Scheman building. • Conference badges will be available for pickup starting at 8 am. Light breakfast will be provided from 8:00 am to 8:25 am. • Poster stands will be available in the second floor Scheman lobby all day. Please hang your poster early in the morning so that the are available for discussion during coffee breaks and the lunch hour. • Lunch is included with your registration. Lunch will take place in the main meeting room. • The cocktail hour/poster session will take place in the lobby. A drink ticket is included with your registration.